Today, the Senate passed a bipartisan bill, the FOIA Improvement Act of 2016 (S.337), to strengthen the Freedom of Information Act by codifying the presumption in favor of disclosure (often referred to as the presumption of openness) outlined in President Obama’s Memorandum on the Freedom of Information Act; harnessing technology to improve the FOIA process, including requiring the creation of a consolidated online request portal; ending secrecy for 25-year-old drafts and other internal deliberations not otherwise exempt from disclosure; and increasing the independence of the Office of Government Information Services. The House passed its own FOIA improvement bill, the FOIA Oversight and Implementation Act of 2015 (H.R. 653), in January 2016. AALL commends Congress for recognizing the importance of a strong FOIA law. It is especially meaningful that the Senate took this step during Sunshine Week 2016 (March 13-19), a nationwide initiative to highlight the importance of open government, and just months before the 50th anniversary of the FOIA on July 4th, 2016. We encourage the House and Senate to join together to work out the differences and send the FOIA reform bill to the President’s desk. The 113th Congress has come to a close, marking the end of a historically unproductive and largely dysfunctional term. While political and economic factors created new advocacy challenges in 2014, AALL members rose to the occasion and helped to achieve real progress on several of the Association’s Public Policy Positions. Here’s a roundup of action on our priorities in the past year—including several lame duck developments. The recently passed “CRomnibus” spending bill for Fiscal Year 2015 (H.R. 83) included slight increases in funding for the Government Printing Office and the Library of Congress, as well as one particularly noteworthy policy change: it re-names the Government Printing Office as the Government Publishing Office. Throughout the year, AALL members worked in support of the Government Publishing Office Act of 2014 (S. 1947) to provide GPO with a name that more accurately reflects the agency’s role as the “official, digital, secure” source of federal government information in the digital age. S. 1947 was reported by the Senate Committee on Rules and Administration but never received floor time. Instead, the bill text— which also changes the titles of the public printer and deputy public printer to “director” and “deputy director” and replaces gender-specific terms with gender-neutral ones— was rolled into the spending bill and passed into law. Though both the House and Senate cleared their respective bills to improve the Freedom of Information Act (FOIA) in 2014, the FOIA Improvement Act (S. 2520) will not become law this year. After clearing a challenge from outgoing Senator Jay Rockefeller (D-W.V. ), the Senate bill moved to the House last Monday. Despite what appeared to be solid approval in the House, leaders in that chamber failed to put the measure on the calendar before their members adjourned for the year. The bill would have established a “presumption of openness” with government information, codifying President Obama’s 2009 directive to federal agencies. Congress is likely to revisit the issue next year. This year, President Barack Obama signed into law H.R. 1233, the Presidential and Federal Records Act Amendments of 2014. This set of amendments is the first statutory change to the Federal Records Act since it was passed in 1950 and implements the important modernization of the definition of a federal record to include electronic records. It also makes several updates to the Presidential Records Act to improve access. Among several key provisions, the new law codifies the procedures by which former and incumbent presidents review presidential records for constitutional privileges and establishes a reasonable standard for release of records. When the House passed the Federal Register Modernization Act (H.R. 4195) in July, AALL advocates stepped up their advocacy efforts to defend the statutory requirement to print the Federal Register and Code of Federal Regulations and produce indexes for these resources, which would have been eliminated by the bill. Sharing anecdotes about the usefulness of these texts and their indexes in print helped the Government Relations Office to engage with Senate staff about our concerns. The bill died in the Senate. Efforts to update the Electronic Communications Privacy Act (ECPA) and reform the National Security Agency’s domestic surveillance practices were both stalled in 2014 amid contentious party divisions. The Senate blocked consideration of the USA FREEDOM Act (S. 2685) in December, despite support from the White House, Director of National Intelligence, Senators from both parties, tech companies, and a wide coalition of organizations for the bill to curb domestic surveillance practices. Critics of the legislation said they preferred to use the June 2015 reauthorization of the USA PATRIOT Act to enact reforms. A similarly popular bill, the Email Privacy Act (H.R. 1852) to update ECPA, gained 272 co-sponsors this year but was never awarded floor time because one federal agency, the Securities and Exchange Commission, worked to keep the bill from coming to fruition. While AALL is disappointed that both efforts fizzled out, we look forward to the renewed opportunity to advance important privacy protections for individuals and library patrons in the new Congress. On Thursday, the Senate Judiciary Committee unanimously approved the FOIA Improvement Act (S. 2520), bipartisan legislation authored by Senator Patrick Leahy (D-Vt.) and Senator John Cornyn (R-Texas) to strengthen the Freedom of Information Act (FOIA). AALL applauds the Committee’s swift passage of S. 2520, which would require federal agencies to adopt a “presumption of openness” when considering the release of government information under FOIA. The bill also aims to reduce the overuse of exemptions to withhold information from the public and would provide the Office of Government Information Services (OGIS) with additional independence and authority to carry out its work mediating FOIA disputes. In a letter sent Wednesday, AALL joined more than 70 organizations urging the Judiciary Committee to support the measure. In February, the House passed a similar bill, the FOIA Oversight and Implementation Act (H.R. 1211). However, the Senate will need to act quickly on S. 2520 and conference both bills before FOIA reform can be written into law. AALL encourages the Senate to consider and pass the FOIA Improvement Act without delay. AALL has joined more than dozen groups in endorsing model Freedom of Information Act (FOIA) regulations released last week by a coalition of transparency advocates. The authors of the model regulations—Citizens for Responsibility and Ethics in Washington (CREW), the Electronic Privacy Information Center (EPIC), and the National Security Archive—are experts in FOIA litigation. Making disclosure the default by formalizing the president’s directive for an agency to release information in response to a request except when it clearly identifies specific, foreseeable harm arising from the disclosure. Reducing unnecessary secrecy by requiring agencies to review classified documents that are the subject of a FOIA request to see whether they now can be disclosed. Saving taxpayer resources by encouraging agencies to post documents released through the FOIA process online. Encouraging dispute mediation by informing the public that the Office of Government Information Services can help settle disputes. The Office of Information Policy (OIP) at the Department of Justice is set to develop common FOIA regulations that all agencies can adopt as set forth in the administration’s Second Open Government National Action Plan. AALL urges OIP to consider the input of the requester community and transparency groups in its development of common regulations, including the thoughtful recommendations outlined in these model regulations. During last week’s Open Government Partnership (OGP) meeting in London, the Obama administration released a preview of its U.S. Open Government National Action Plan 2.0 (NAP). While the second NAP will not be finalized until December 2013, six new commitments to further advance the goals of transparency and accountability in the federal government were announced. They include expanding open data, increasing fiscal and corporate transparency, advancing citizen engagement, more effectively managing public resources, and most significantly, modernizing the Freedom of Information Act (FOIA). In the White House’s own words, “the FOIA encourages accountability through transparency and represents a profound national commitment to open government principles. Improving FOIA administration is one of the most effective ways to make the U.S. Government more open and accountable.” In its new commitment, the administration pledges to implement a consolidated online FOIA portal that allows the public to submit a request to any Federal agency from a single site, develop common FOIA regulations and practices across agencies, and create an interagency working group and advisory committee to improve FOIA processing. FOIA professionals and agency staff will also receive improved FOIA trainings. The draft OGP plan also includes a commitment to re-launch Data.gov with an expanded index of all agency data sets and special campaigns to unlock agricultural, nutrition and disaster-related data. In an effort to make government data more accessible and useful, federal agencies will also be required to develop an inventory of their data and publish a list of datasets that are public or can be made public. Under the title “Managing Government Data as a Strategic Asset”, the plan pledges that agencies will also develop new mechanisms to solicit public feedback regarding open government data. AALL applauds the administration for their continued commitment to transparency reforms and we look forward to the release of the second National Action Plan. Access to government information is crucial to a just, democratic society and informed citizenry. AALL will continue to work with the administration and other organizations to promote policies, regulations, and guidance which encourage openness, transparency, and public participation. A recent General Accountability Office (GAO) audit of the Office of Government Information Services (OGIS) gave mixed reviews to the agency’s success in meeting its statutory responsibilities. OGIS is charged with recommending policy changes to improve the Freedom of Information Act (FOIA) process, offering mediation services to help resolve disputes between requestors and agencies, and acting as ombudsman by responding to the needs of the diverse FOIA community. While recognizing the constraints of OGIS’s limited budget, the GAO report concludes that OGIS’s actions are not as robust as they should be to effectively comply with the law and points to the failure of OGIS to create a plan for conducting comprehensive reviews of federal agencies’ FOIA policies or compliance. Since its establishment in 2009, OGIS has provided comments on proposed FOIA regulations for 18 of 99 federal agencies that administer FOIA, as well as a number of Privacy Act system of records notices, according to the GAO report. While OGIS has suggested improvements to a number of those regulations and notices, GAO finds it has “not performed the reviews of regulations and notices in a proactive, comprehensive manner, and has not conducted any reviews of agencies’ compliance with the law.” OGIS is in the early stages of developing a methodology for conducting such reviews and GAO recommends that they agency set a time frame for completing this work and under which to begin carrying out proactive evaluations of agency compliance. The report also calls for the creation of performance measures for its mediation services. In a blog post last week, director of OGIS Miriam Nisbet responded to some the criticism leveled in the GAO report. Ms. Nisbet points to the “lessons learned” in the last four years of OGIS’s work, highlighting that above all “It is challenging to define ‘success’ in providing mediation services.” Given OGIS’s broad mandate and the great demand for OGIS’s services, the constraints of a small staff, limited budget, and large caseload present challenges. Further, it is not obvious that Congress necessarily intended for OGIS to conduct comprehensive reviews, as GAO assumes, or that such an approach is necessary for OGIS to exercise effective oversight. OGIS is working on an action plan to respond to the challenges identified in the GAO report and will share it with the public in the coming weeks. AALL has been supportive of OGIS and its important work in mediating FOIA disputes and offering training to agencies, and we commend the agency’s leadership in developing a uniform, centralized location to make and manage information requests. We hope to see continued Congressional support for OGIS. By promoting the availability and importance of OGIS’s mediation work, the government can avoid the animosity and costs associated with litigation and better facilitate the legal right of access to government information under FOIA. Monday marked the launch of the much-anticipated FOIAonline, the Freedom of Information Act (FOIA) “portal” or “module” aimed at streamlining FOIA requests and administration across agencies. 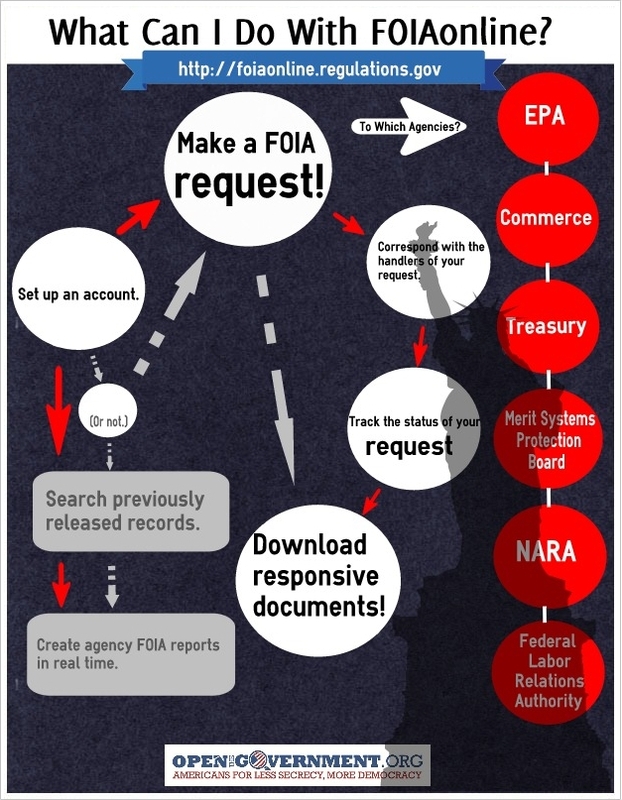 Developed by the Environmental Protection Agency (EPA), the Commerce Department, and the National Archives and Records Administration (NARA), the new website offers a “multi-agency, shared-services solution” for FOIA requesters and uniform tool for FOIA administration. Users may now submit and track FOIA requests using the portal, search and download requests and response records, correspond with processing staff, and file appeals. In addition to EPA, Commerce, and NARA, two smaller agencies, the Merit Systems Protection Board and the Federal Labor Relations Authority, have begun using the system to process FOIA requests. In previous discussions of the module, EPA, Commerce, and NARA noted that several other agencies were considering use of FOIAonline for their agencies’ requests, with the ultimate goal of directing all FOIA requests through the site. Remember, the content available on FOIAonline is only as good as the requests made. Users are encouraged to create an account to allow easy request tracking and can expect more information—and hopefully more agencies—on FOIAonline soon. You are currently browsing the archives for the FOIA category.